Buda is the glamour half of Budapest, east side of the Danube, home of the Castle District, Matthias Church, the Fishermen's Bastion, and highly expensive housing. Pest, on the other hand, is the place where Hungarian things get done, from the Parliament east to Heroes Square, that brilliant, almost sepulchral plaza of arches and statuary nearby our lodgings while we stayed in the city. The first night in Budapest, wearied by the long flights and a delay in London Heathrow, we decided on a walk toward Heroes Square (or Hősök tere), the tourist site on my map that was closest to the hotel. 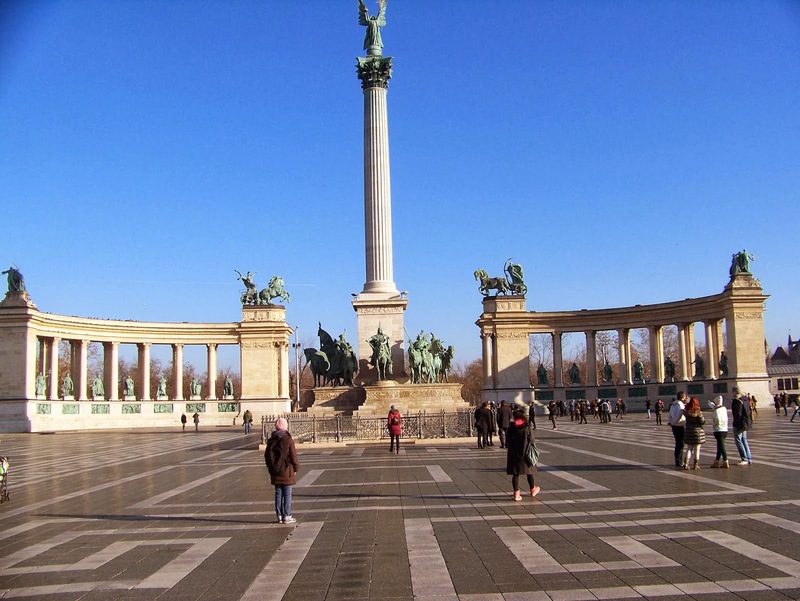 I was unprepared for Heroes Square, proceeding under the assumption that it was the Statue Park, the odd reliquary for Soviet communism that in reality lies a short distance outside the city—a place that we ended up not visiting this time in Budapest. So I imagined those dismal Eastern Bloc constructions—outsized remnants of socialist realism, where the men all looked like Stalin, and those women who didn't look like Stalin looked like Stalin's mistresses. We were headed, I assumed, toward the kind of display that our own Cold Warriors would have warned us about in the Missile Crisis days had they cared anything at all about poetry or art, had they not vied with the bleak propaganda of communist art by simply not caring about any form of artistic expression that didn't sell. In short, I expected very little. It was a first-night, off-the-plane excursion. I was pleasantly surprised. The statues around Heroes Square were indeed outsized, and a kind of late 19th century Romanticism that's not necessarily to my liking. But at least it wasn't the Politburo. Two colonnades form a half circle at the eastern edge of the plaza, atop them symbolic figures representing War and Peace, Work and Welfare. Within the colonnade stand the Heroes, and it is immediately apparent that War is the most influential of the stone emblems: kings and commanders dominate the lineup. I suppose that the sentiment of its time was not unlike 19th century America's love affair with its generals. And yet among them were men of peace—or at least the peaceful faces of men of war. King Matthias and his scholars. 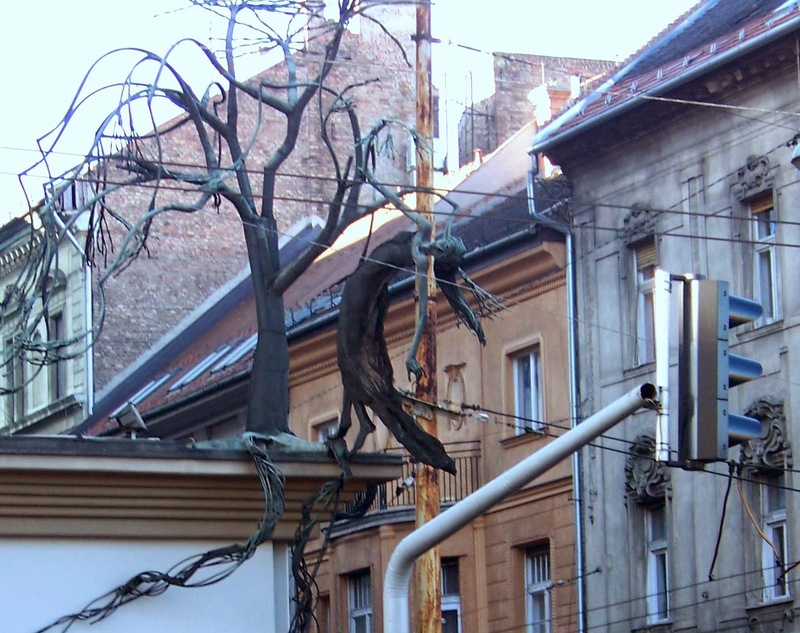 Coloman of Hungary, king and bishop, who stood against the witch burnings of his time, burnings still recalled by the sculpture at our hotel entrance, where the witch, entangled in blackened bronze, fades into the surrounding buildings and the power lines. A more magnificent statue dominates Heroes Square. Standing tall and brilliant in front of the intersection of the colonnades is the famous statue of the Archangel Gabriel. We were told by our guide the next day that this statue was "voted the best statue of Gabriel in the world, by those who know"—an enigmatic statement that left me wondering who those Gabriel experts might be. Nevertheless, the statue—the archangel holding a crown—is impressive, and perhaps “those who know” are altogether right in this matter. The square is framed by art museums. On the north side is the Museum of Fine Arts, which when we visited was, to my delight, housing a traveling Caravaggio exhibition. The Palace of Arts, on the south side of the square, was a center of performing arts, and the events scheduled for the time of our stay were specifically national and contemporary, so we picked tradition over exploration and planned our Caravaggio visit for the following day. Which speaks to a point. As an artist of sorts, I am usually inclined toward the new and experimental. But here on markedly foreign turf, more tourist than artist, I gravitated toward the known, the sanctioned, the familiar. Caravaggio wasn't even Hungarian, I would remind myself in the days that followed, as the opportunity offered by the Palace of Arts faded behind me on the train to Vienna. 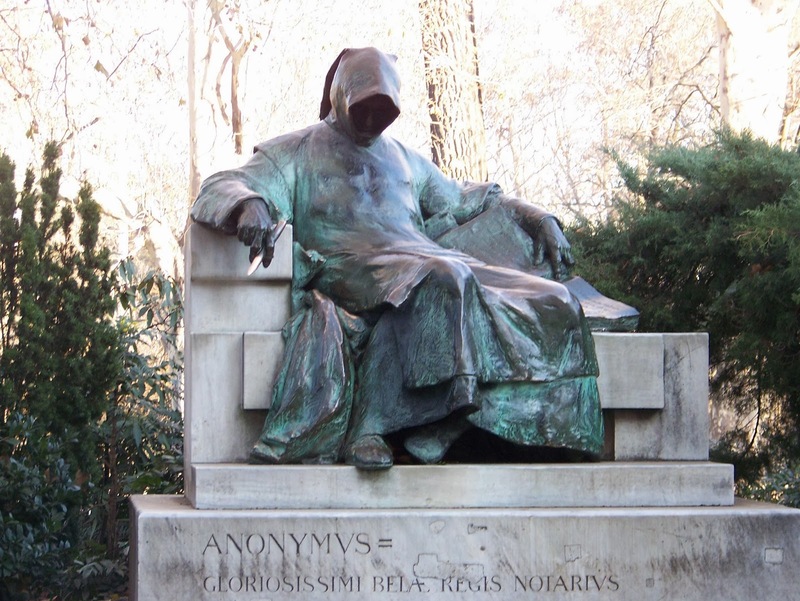 In Hungary I brushed against a vivid culture and history almost completely alien from my own, and it made me think about anonymity, that sometimes good work is lost in place as well as in time. And as an artist of minor sorts, I am more and more humbled by the inevitability that the survival of my own work is dependent on these large and immovable things: that it is limited by the restraints of home geography and sequestered talents. That as writers we see things pass from print, search for recommended books to find they haven't been published in years and that the search in the most obscure sites may roust no words out of oblivion and decay. Only a block or two from the square is the bizarrely eclectic Vajdahunyad castle, a relative newcomer to the cityscape when you consider the old origins of some of the structures across the Danube. Built in the same era (and with the same impulse) as Heroes Square, it is a gallimaufry of architectural styles—Baroque, Gothic, Renaissance, Romanesque all gathered together and lost in a strange larger purpose—entire in its oddness, occasional awkwardness, and beauty. It houses two famous statues: one of Bela Lugosi, of course, and another of Anonymous.